Poindextor Explorer, Sam Jenkins, will be cycling 50 miles at Windsor Racecourse on Saturday 1st April to complete his Duke of Edinburgh Bronze award physical challenge. He is asking for sponsorship in the form of donations to the New Scouting Centre Appeal; his target total is £274 as we need to raise this amount every day for the next year! Click here to view Sam’s BT MyDonate page. Police Sgt Ben Phipps, who covers Northwood and Northwood Hills wards, is aiming to raise £1,000 for the New Scouting Centre Appeal when he takes part in the Vitality London 10k Run on the 29th May 2017. Thank you for supporting us Ben! To sponsor Ben click here. APPEAL LAUNCHED. On the 1st of March at Fairfield Church in Northwood Hills, the 1st Northwood Scout Group launched its £100,000 appeal to replace the existing Scout Hut with an enlarged Scouting Centre. The launch was attended by the Mayor of Hillingdon Cllr John Hensley, and the Deputy Mayor Cllr Carol Melvin; there were also several other important guests present including all three Northwood Hills Councillors, Chief Inspector Rob Bryan and some of his staff, and several members of the REN District senior team. The hall was filled to capacity with guests and many young members and their parents. 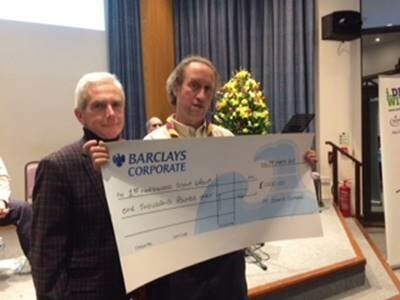 At the end of the meeting, Nigel Stone, the Bursar of St John’s School, presented a jumbo cheque to the Group for £1,000, kick starting the fundraising appeal. We are fortunate to have as our Patrons for the appeal Nick Hurd MP and Councillor Carol Melvin. Nick Hurd was unable to attend, but addressed the meeting via a pre-recorded video. Click here for more about this exciting project.